Are you prepared for immigration enforcement actions? You are here: Home / Nursery Operations / Are you prepared for immigration enforcement actions? Protect your business with this 10-point plan in the event of an ICE inspection. Stay updated on OAN Workforce page! The OAN created the Workforce resource webpage — www.oan.org/workforce — to address the recent enforcement activity by federal Immigration and Customs Enforcement. The webpage will continue to be updated with current news and information as well as helpful downloads. The webpage is created and maintained just for members. To access it, you will need to log in as an OAN member. If you don’t know your OAN website login information, please call the OAN office at 503-682-5089. Over the last few months, there has been an increase in enforcement activities by the U.S. Department of Homeland Security Immigration and Customs Enforcement (ICE). This coincides with several Trump administration announcements indicating that it intends to significantly increase the number of ICE field agents and ratchet up enforcement activities. In Oregon, we’ve begun to see this shift in policy play out in the form of enhanced ICE agent activity and arrests. On January 30, for instance, ICE agents arrested 64 foreign nationals in Oregon and Southwest Washington, including five persons at or near courthouses in Multnomah County. In late February, ICE agents stopped two vans carrying workers headed to pick ornamental shrubs and detained 10 of them. In light of the increase in ICE enforcement activity, now is a good time for nursery businesses to make sure that they are prepared for an immigration inspection. ICE agents are most likely to come to your business for one of two reasons. The first is to conduct an inspection of your I-9 Employment Authorization Verification records. The second is to conduct an immigration enforcement raid to find and detain undocumented workers. This article focuses on I-9 inspection actions. The best thing a business can do to be prepared for an I-9 records inspection is to conduct a self-audit of those documents and the company’s procedures. The purpose of a self-audit is to identify deficiencies in I-9 processes and paperwork and then take legal steps to correct them. A self-audit not only helps with compliance, but also is considered part of an employer’s good faith defense in the event ICE finds I-9 violations. Learn more about how to perform an I-9 self-audit at http://jordanramis.com/resources/articles/internal-i-9-audit-and-correction-instructions/view/. We recommend contacting legal counsel or a knowledgeable human resources consultant with I-9 audit experience to assist you in the process. If ICE agents arrive at your business to conduct an I-9 document inspection, there are several things that you should know and do. Be aware that this is often the first step of a criminal investigation, so you should contact legal counsel immediately. ICE inspections can take two forms. The first is a raid, which does not require any advance notice to the business, but which requires a search warrant. The second is an I-9 audit, for which a business is entitled to three days’ advance notice, but for which a warrant is not required. The U.S. Department of Labor is also authorized to perform I-9 audits, so it is important to understand which agency is seeking to review your records and under what circumstances. 1. Understand that you are protected by your constitutional rights. Try to remain calm and professional in your interactions with ICE agents. You are entitled to federal constitutional protections against unreasonable searches and seizures. 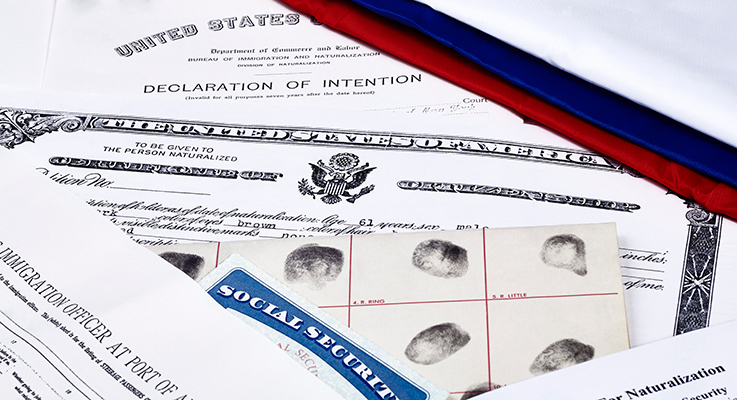 ICE is required to follow procedures designed to protect those rights, including the use of warrants and subpoenas before accessing any records or any portion of your business premises. Make sure your front-line employees know they must not give permission to ICE agents to access any portion of the property. They should instead immediately notify a manager who should ask whether the agents have a warrant or subpoena. 2. If you are served with a warrant or a subpoena, ask for identification (a business card) from the agent presenting the warrant or subpoena. Ask whether the purpose of the visit is a raid (requiring a warrant) or an I-9 document audit. Ask to review any warrant or subpoena and take your time to understand it. Call your attorney immediately and get him or her a copy of any document(s) presented. ICE must have a judicially issued warrant to search your premises. An administrative order issued by the agency itself is not sufficient grounds to search your premises or your records. 3. If the purpose of the visit is an I-9 audit and the agent does not have a warrant, you are legally entitled to three days’ advance notice before the inspection may commence. This is true even if the agent has a subpoena. Agents are required by law to notify an employer of the right to a three-day notice prior to review. You should exercise this legal right and decline immediate review. Then, contact legal counsel immediately. 4. Understand that an ICE inspection is often the first step in a criminal investigation. Once ICE agents appear on your premises, you should inform your managers and human resources staff of the investigation and remind them of their rights and obligations. All of your employees have a right to legal counsel and may assert that right at any time to decline an interview or other questioning by ICE agents. None of the company’s management should consent to an interview without first speaking to the company’s legal counsel. 5. Follow all verbal instructions given by ICE or other law enforcement personnel, even if the instructions appear to conflict with the advice of your attorney. 6. Don’t attempt to interfere with the process or you may be subject to criminal charges. Do not take any steps to notify non-management personnel or help employees hide or leave the premises. 7. Observe the investigation process. Company management may (and should) accompany ICE agents during the search. Take notes as to what occurs: what documents are inspected, who is contacted by the agent(s), whether the agents seem to be badgering or singling out any specific employees or class of employees. But again, do not interfere in any manner. 8. Advise legal counsel if the agents seek to expand the investigation beyond the scope of the warrant or subpoena. ICE or U.S. Department of Labor agents are limited by the scope of a warrant or subpoena. They may not expand the search beyond what is in the four corners of the document. If you observe that occurring, you should contact legal counsel immediately. Remember, no subpoena is required for a routine I-9 document audit, provided that the three-day notice period is observed. However, in that case, you are only required to produce the I-9 forms for inspection. 9. In the worst-case scenario, members of your organization may be arrested. Should that happen, you should instruct your employees to immediately invoke their right to speak to an attorney. Under no circumstances should the person respond to any questions after invoking the right to speak to an attorney. If possible, find out where the person will be taken. 10. Recognize that your employees may be traumatized, including those whose work authorization status is not in question. You should prepare a message to your employees in advance of an ICE investigation rather than waiting until it happens. You should also provide employees with an opportunity to ask questions and be prepared to direct them to outside resources that may help inform them as to their rights. If you have an employee assistance program (EAP), you should notify your EAP provider about the ICE action so they are prepared for phone calls from your employees. Remind your employees about the EAP benefit available to them and provide them with the phone number. The best way to prepare for an I-9 inspection is to establish protocols and to train your management staff on how to implement the protocols. If your management staff is prepared, they will understand how to handle unannounced government visits in a professional and appropriate manner. Each business is unique, so the list of tips above is not intended to be comprehensive or tailored to your situation. But if you apply these tips and create your own crisis management plan, you will have taken an important step toward protecting your business.